-15 M Fraser (Aus); -13 S Lee (Kor), M Tabuena (Phi); -12 J Campillo (Sp) J Quesne (Fra). Selected others: -11 R Bland (Eng); -8 L Oosthuizen (SA); -7 T Fleetwood (Eng), S Gallacher (Sco), J Morrison (Eng), R Rock (Eng). 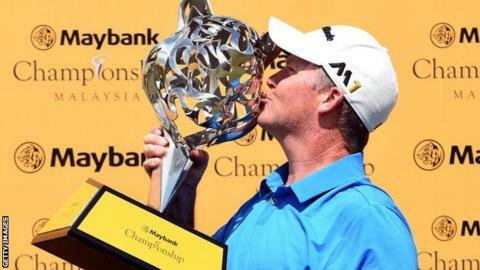 Australian Marcus Fraser took advantage of Soomin Lee's dramatic late collapse to claim the inaugural Maybank Championship Malaysia. The South Korean led by two approaching the final three holes in Kuala Lumpur but double-bogeyed the 16th and 18th. Lee finished joint second alongside Miguel Tabuena of the Philippines. "It's unbelievable, six years since my last title," said Fraser, who had gone 119 tournaments without a win. "My kids keep saying to me every time I walk out the door, 'dad, can you bring home a trophy?' And I say, 'I'll try, I'll try'. "This time I get to take one home and they can take it to school for show and tell, which is going to be pretty cool. That's the main reason I wanted to win."